Throughout Quod Libet, albums are grouped by examining the album tag on individual songs. To support distinct albums with the same name, groups of songs with the same ‘album’ tag are further inspected for the presence of one of three tags: album_grouping_key, labelid, and musicbrainz_albumid, in that order. If a song has any of these, it will be used to identify the album it belongs to along with the album tag. In short, if more than one album in your library has the same name, use one of the secondary tags to separate them. The MusicBrainz plugin will add musicbrainz_albumid tags automatically, and may be the easiest solution for adding identically-named albums to your library. 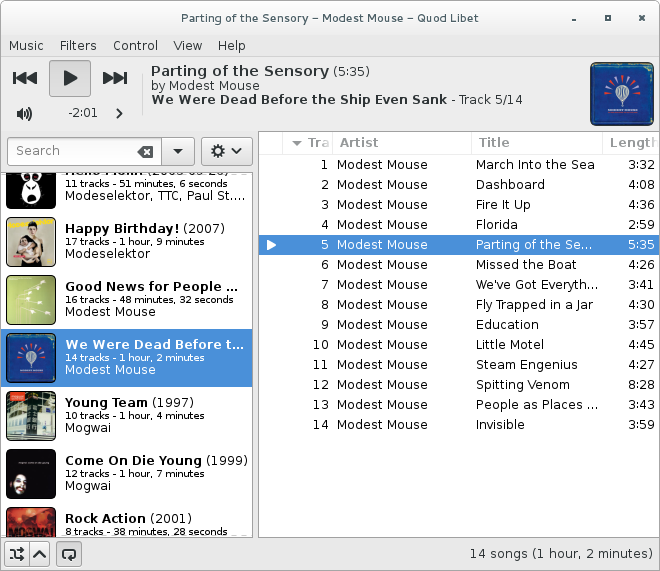 The Album List browser makes it easy to treat your music collection as a set of albums, presented on the left, rather than as a set of songs, via album-centric enhancements to viewing, sorting, and searching. You can (configurably) display the album art next to each album to allow faster identification of your albums (plus it’s just prettier…). Extra features related to searching, sorting and presenting albums are detailed below. 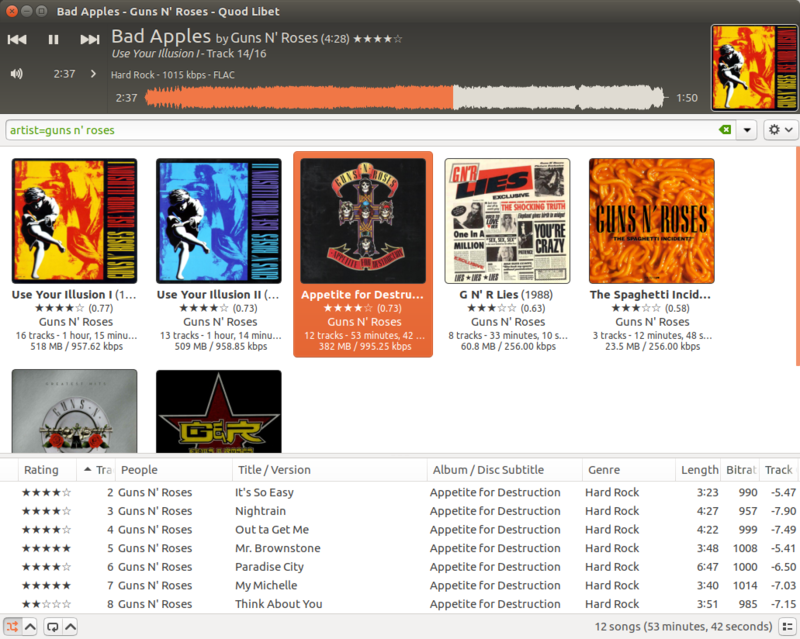 The cover grid is another album-like browser that places more emphasis on the album art. It has a search similar to album list (see the section below), and configuration of its own (including a flexible per-album display area). These tag suffixes work for any numeric search. The options are min, max, sum, and avg (the default). ~#length is computed as the sum of the length of the underlying songs. ~#tracks and ~#discs are the total number of songs and discs in an album. ~people is computed from all underlying tracks, with duplicate entries removed.